Award winning swimming pool construction. Lang Pool & Spa is a family owned business located in Fairfield County, Connecticut. We are members of the Association of Pool & Spa Professionals (APSP) and the Better Business Bureau of Connecticut. Lang Pool and Spa is the leader in Fairfield and Westchester County in the construction of concrete and vinyl liner swimming pools. We understand that your pool is a lifetime investment and we want to provide you with a lifetime of enjoyment. Our company motto is “We build swimming pools and relationships”! Though we build pools at a reasonable price, we do not limit your ability to create the pool of your dreams. Our unique swimming pool is like no other in the industry! From the customization to the many choices of colors for our pools. We use the standard white plaster on our concrete pools but also offer a grey plaster finish or for another level of beauty our pebble tech or 3M Colorquartz™finish. Benches, love seats are a standard giving more enjoyment to your inground swimming pool. For our vinyl liner pools we offer the option to match the interior of our pools whether you have us build you custom vinyl covered steps or standard acrylic steps. We have them manufactured to match the interior of your swimming pool. And with our wide array of choices we let you unleash the designer within! Our vinyl liner pools are less in cost but not in quality and appearance. Only Lang Pools offer this with a vinyl liner swimming pool. The looks of concrete (gunite) but with less cost!! Some build cheaper pools, some build more expensive pools, but no one builds a better pool than Lang Pool! All the components that go into the construction of a Lang Pool are the best in the pool industry! We offer lifetime warranties on all of our pool structures and we use more concrete in our construction than any competitor in the industry. Come to our showroom and see our demo pools! Compare a Lang Pool to the competitors! Or better yet let us take you out in the field to see how we can make your dreams come true! We put a vacation in your backyard at a sensible price. Using green technology and automation paired with the highest quality equipment can allow your waterscape to be maintenance free and have the lowest operating costs. With over 20 years of pool installation experience, Christopher Argenziano has been a leading solution for residents looking to convert their backyards from an empty space, to an oasis-dominated vacation spot. Unlike most pool installation companies, Chris understands that customer service only one piece of a larger project-oriented framework necessary for the completion on an in ground pool that exceeds the customer’s expectations. Rather, Chris focuses on a three part process that ensure you get the most value from The Pool Boss’s ability to install a beautiful pool, and knowledge to consult you on the best possible options based on your desire and the scope of your property. The Pool Boss remains committed to one-on-one personal customer service every step of the way. Tranquility Pools, INC. is an elite swimming pool design and build firm. Mitchell Knapp and his team have been in the business of managing, designing and general swimming pool contracting for over 25 years. We pride ourselves on our ability to create Utopian escapes within the confines of your own backyard. We promise only professional standards and unparalleled customer service from day one of the project through the final completion. At Tranquility Pools, our entire team will work with you to come up with the perfect swimming pool for your backyard. Every pool is unique and built custom to our client’s needs. Anything you can dream, we can create. Since 1972, we have been building and servicing pools. We are a BBB A+ rated company. Our specialities include pool openings and closings, liner installations, pool installations, safety covers, pool heaters and salt chlorine generators, weekly service and furniture shrink wrap. The Platinum Group has redefined the standards of excellence with regard to outdoor construction on Long Island. It is our commitment to provide you with the absolute highest quality and level of service. We are confident that our team of designers, project managers, specialists and office staff will meet your every need and surpass your expectations. Our uncompromising attention to detail and decades of experience will help transform your property into the oasis you have envisioned. We look forward to the opportunity to earn your confidence. Voted Best Swimming Pool Company On Long Island, by the Readers of The Long Island Press. This Is Our 10th Year In a Row To Be Named The Best Pool Company on L.I. Brothers 3 Pools has been Long Islands #1 choice of Pool companies for over a half century. We offer the Very Finest Pools, and they are manufactured on Long Island by people just like us. "Long Islanders" Our Pools have been Specifically Designed for the Tough Long Island Year Round Environment, not just for a warm climate where the pool never faces tough cold winters. Our Pools have over 50 years of a successful track record to prove it. Being Long Islands Leader for the Absolute Finest Above Ground and Semi In ground Pools has been our reputation for over a half century. Owning a swimming pool has always been a great way to spend quality time together as a family. Why not stop by one of our showrooms and let us show you how you can make a Brothers 3 pool part of your families dreams. 2016 Top 50 Pool Builder Nationally, Cipriano Landscape Design is a Northern NJ firm who can complete your entire custom landscape and inground swimming pool design and construction project. Since 2006 the Cipriano team has won 90 landscaping and swimming pool awards including 20 international design awards. Since 2007, Cipriano Landscape Design has been recognized as one of New Jersey's leading custom swimming pool builders with a "Best in Competition" Award from the North East Spa & Pool Association. When you hire Cipriano Landscape Design, not only do you reap the benefits of award winning experience, but you also feel the comfort of knowing every aspect of your landscaping and swimming pool project is designed, built, serviced and guaranteed by a single company. Contact us for a consultation today. Landscape Design Service - $3,000 to $20,000. New Pool Construction - $60,000 to $1 million. Pool Renovations - $25,000 to $250,000. Landscape/Plantings - $10,000 to $250,000. Hardscape/Outdoor Kitchens/Fire Features - $10,000 to $150,000. Landscape Maintenance (seasonal) $15,000 to $35,000. Estimates based on experience. Your actual costs may vary depending on the scope of your project. B&B Pool and Spa Center has been building beautiful, top-quality pools and spas for residential and commercial customers since 1972.. Set in fully landscaped and equipped outdoor environments, our creations win national and international awards for design excellence and professionalism. Our family-owned and operated business provides: 21st century, Sustainable Technology – such as our patented IntellipoolTM and IntellispaTM systems for energy-saving, low-maintenance pools and spas. One-Stop Shopping – B&B will handle all the details relating to your pool installation, including permits, plumbing, electric, construction, patios and landscaping. Personal Attention – ensured by the quality of our materials, systems, methods of construction, and equipment. Experienced Staff – the members of our construction staff have an average of more than 25 years in the industry. The Best Products – from top manufacturers such as Pentair Pool Products, Sundance Spas and Viking. The Greatest Choice – as a warranty center for the products we sell and install, our factory-direct relationship gives us access to each manufacturer's entire product mix, not just what's available locally. Extraordinary Attention to Safety – with safety as our first consideration, we offer Pool School – customer programs on safety and pool maintenance. We also provide water safety information to the community. Ocean North Pools designs, creates and maintains award-winning swimming pools and outdoor environments in Stamford, Greenwich and Connecticut's Fairfield County. 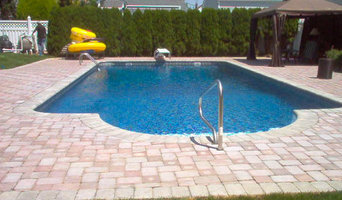 Fortunato Concrete Pool Restorations, Inc. was founded in 1993 by Joe and Debra Fortunato in Howell, New Jersey. Their goal was to provide custom concrete swimming pool and spa design and installation to Central New Jersey and eventually beyond. The family enterprise has grown exponentially in the past twenty-six years and Joe has since passed his portion of the business onto his sons. Still family owned and operated today, James is our restoration manager and Joe Jr. is our new construction manager. Debra is still the owner-operator while Julie, Joe Jr.’s wife, handles day-to-day management and Jessica, Joe and Debra’s daughter, manages marketing. We’ve been honing our skills, from our office to your backyard, for over twenty years to be able to give our customers the best pool renovation and construction experience possible. We are experts in customizing and building high-end residential and commercial concrete swimming pools and spas that not only add to the value of your home but completely transform your backyard and extend your living space. Our unique services can offer you elegance and durability like no other concrete swimming pool provider. The Fortunato family takes great pride in the level of workmanship and materials we offer. Our reputation for custom stone and tile work, inside and around the swimming pool, sets us apart from the competition. In addition to earning a Certified Building Professional (CBP) license from Association of Pool and Spa Professionals (APSP), Fortunato Pools is also backed by the Northeast Pool and Spa Association (NESPA) and the Better Business Bureau (BBB). You can trust the Fortunato family to transform your pool and backyard into a personal resort with the pride and integrity of a large corporation and the intimacy of a small business. We look forward to working with you and your family, giving you an endless vacation in your own backyard. Whether your existing pool needs and upgrade or your new pool demands a personal touch, call or email us today for a free consolation. At Fortunato, we’re all family. Founded in 1968, Haven Pools has been a family owned and operated business building gunite swimming pools and spas on Long Island for 47 years and at the same address since 1969. Building only custom gunite pools and spas has allowed us to become the preeminent builder on Long Island. A wealth of experience, coupled with the bountiful exuberance of youth has given us “Old World” craftsmanship blended harmoniously with cutting edge technology. Competence and professionalism at every level, we produce detailed and impressive proposals, provide easy accessibility, and a vigilant work ethic. Building well beyond industry standards, we consistently exceed client’s expectations. Reliability, together with unwavering integrity throughout our organization, has yielded grand results. Thank you, we look forward to working together with you in the future. For more information please do not hesitate to call or email us. In2Blue is your destination for inspired swimming pools and landscape design. We strive to help homeowners find an uncluttered, reasonable approach to developing their outdoor environments, without all the pretentiousness. We truly believe in a hands-on approach, from design to fruition. Sweeny's Pool Service is a professional swimming pool company that will walk you through the entire pool project process from permits to completion. We use advanced computer programs to generate a 3D view of your backyard so you can be confident with the design you choose. You can view different landscape designs from paving stones to rock waterfalls to make sure your investment is just the way you like. In the spring of 2012, Sweeney’s Pool Service entered the industry with a mission. The mission was simple, to listen carefully to the customer and provide a reliable service. Since the beginning, we went back to the basics and studied the core values of a successful business. They started with the initial interaction with the customer, which starts in the office. With the right team of individuals, Sweeney’s Pool Service has been able to continue their success and gain many customers throughout the past 5 years. Each year they continue to listen to their customers and apply that feedback to better serve the community. Kenneth Sweeney sums up the foundation of his companies growth in a few simple words, “Professionalism and Reliability is the key to Success”. True Blue Swimming Pools, established in 1991, is a quality oriented business that relies on satisfied customer referrals for its future. Owner Michael Truehart, President of the Long Island Pool and Spa Association, has been a resident of Long Island all of his life and has over 35 years of experience in the swimming pool industry. He has earned the title of Certified Building Professional through the APSP - an important certification in the industry. The company's hands-on approach to business has earned it an excellent reputation for quality workmanship, reliable service, and competitive pricing. True Blue has installed hundreds of pools all over Long Island. We are the recipient of over forty Design/Build Awards from International, National, Regional and Local Associations. We are licensed and insured in both Nassau and Suffolk counties. We are long standing members of the APSP (Association of Pool & Spa Professionals), NESPA (Northeast Spa and Pool Association) and LIPSA (Long Island Pool & Spa Association) as well as the Better Business Bureau. We are a full service in-ground pool company. We have installed thousands of pools over the last pools 50 years. Fairfield Pool is the Southwestern Connecticut dealer for Leisure Pools,the market leader in one piece composite fiberglass pools. We have our own teams of professional installers whose knowledge and expertise yields a beautiful pool every time. We can help you create the kind of environment that keeps the family engaged and creating memories that will last a lifetime.Say g'nite to gunite and save tens of thousands and weeks of construction headaches. If you’ve been dreaming of relaxing summer days spent poolside, it may be time to consider hiring a Freeport pool builder. A professional can not only help with design and pool installation, but also aid in appropriate maintenance once it’s complete. Whether you're at the beginning stages of planning or want to revamp your existing pool, a pool company in Freeport, NY will be able to get you on the right track. What exactly do Freeport pool builders do? If you are planning for a new pool in Freeport, NY, a swimming pool builder will analyze your outdoor space and your aesthetic wishes to determine an appropriate design for your yard, installing it once the plan is developed and approved. Once installed, some pool companies in Freeport, NY can handle the necessary cleanings, water testing, renovations and equipment replacement or repairs for your pool or spa. If not, many can also suggest Freeport, NY swimming pool contractors or maintenance services to help with upkeep or repairs down the road. Here are some related professionals and vendors to complement the work of swimming pool builders: Garden & Landscape Supplies, Landscape Architects & Landscape Designers, General Contractors, Landscape Contractors, Solar Energy Contractors. Before hiring a swimming pool construction company to create your new Freeport, NY pool, determine how you'll be using it. Will it be for fun or for lap exercise? Will the primary users be children, adults or a mix of the two? Knowing the use can help you find Freeport pool builders who shares your aesthetic. Once you find swimming pool builders in Freeport, NY who share your style, research is critical. Review customer references and comments, collect at least three to four estimates to compare, meet with potential Freeport pool designers and builders in person and ensure that they are New York certified service professionals and licensed with the registrar of contractors before making any final decisions. In addition, get a sense whether they plan to complete the pool installation and be done with it, or whether they seem interested in building a long-term relationship with you. Be wary of the former: it's likely a reflection on the level of quality of the pool construction they do. Find a Freeport pool contractor or designer on Houzz. Narrow your search in the Professionals section of the website to pool builders in Freeport, NY. You can also look through Freeport, NY photos by style to find a pool or spa you like, then contact the local pool company who designed it.